Shown here DC to 18 GHz BMA Contacts in Stainless Steel Shells. ConductRF introduces custom Multi-Port RF Solutions using the Mil D38999 Standards for applications across both military and commercial markets from DC to 60 GHz. The D38999 standards provide a huge commonly available Multi-Port configuration range which ConductRF uses to enhance with both Mil Standard and precision RF solutions. With significant high frequency capabilities and its state of the art phase matching techniques, ConductRF provides support that includes state of the art phase matching capabilities to very tight tolerances. 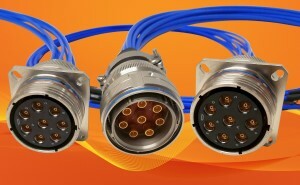 With many raw cable alternatives, variations in Power, Loss & Operating Temperature & Environment, may solutions are available to suit a wide array of user needs. ConductRF also provides external enhancements for finished cables with Conduit Armor, Nomex, Potting and Over-molding. Customized marking and serialization is also common, particularly for Phase Matched Harnesses. ConductRF provides wide-ranging solutions for RF Interconnect products. Our RF cable assembly capabilities extend all the way to High-Performance RF VNA Test Cables, operating up to 110 GHz. Our product ranges have suitable options for many specialist applications at various market standard frequency values. We support specific technical characteristic requirements including; Stability, Low Loss, High Power and Low PIM to name only a few. We offer mechanical enhancement including Waterproofing and Armoring.